SKU: BRAC-RAV-LI. Categories: Bracelets, Cuffs & Arm Rings, Light Braided Bracelets. 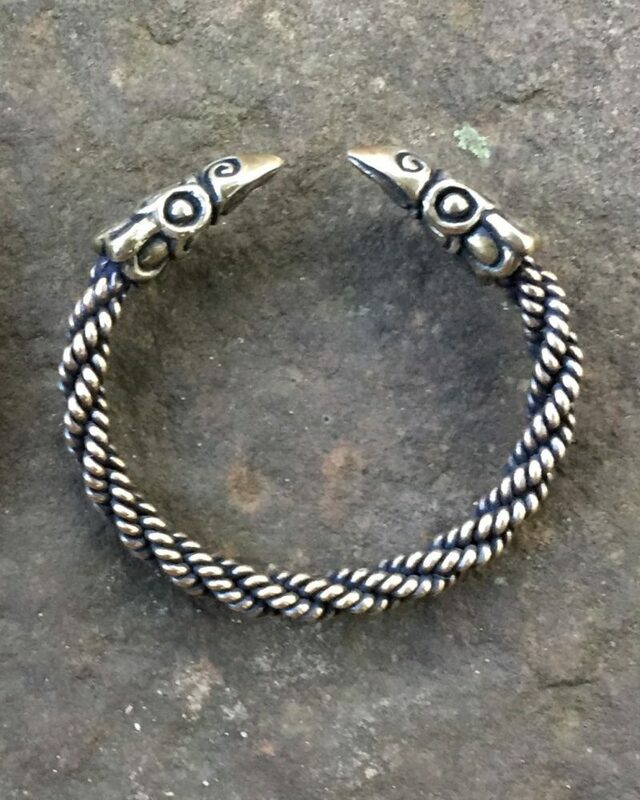 Wear the strength of Morrigan around your wrist every day with our Celtic Raven Bracelet! Our Light Raven Bracelet is constructed with a light braid of wire, and is approximately 1/4 inch (6 mm) thick. It is available in bronze and sterling silver. We also offer a Medium Raven Bracelet. Ravens figured heavily in Celtic mythology and legend. They were linked to darkness and death, especially the death of warriors in combat – an obvious reflection of its tendency to eat carrion, plenty of which is to be found in the aftermath of battle. The Celtic war goddesses Morrigan, who was known for her ability to predict the outcomes of battles, often took the form of a raven. However, the highly intelligent ravens were also thought to be the messengers of the gods as they traveled between the worlds, bringing otherworldly advice and knowledge.